O my mind, meditate on the Lord of the World, the Master of the Universe, the Life of the World. Fall in love with Him, the Enticer of the mind. I take the Support of the Lord, all day and all night. Endless, endless, endless are the Praises of the Lord. Suk Dav, Naarad and likes of Brahma all sing His Glorious Praises. Your Glorious Virtues, O my Lord cannot even be counted. O Lord, You are Infinite, O Lord, You are Infinite, O Lord, You are my Lord and Master; only You Yourself know Your Own Ways. Those who are near, near to the Lord – those who dwell near the Lord – those humble servants of the Lord are the Holy, the devotees of the Lord. Those humble servants of the Lord merge with their Lord, O Nanak, like water merging with water. 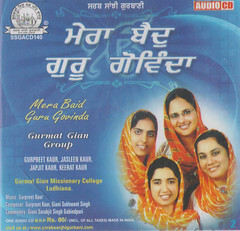 This entry was posted in Shabad Kirtan and tagged Gurbani Sangeet, Gurmat Gian Group, Gurmat Sangeet, Gurpreet Kaur, Jagannath, Jagdish, Jagdishro, Jap, Japjit Kaur, Keerat Kaur, Keertan, Kirtan, Man, Shabad, Shabad Kirtan. Bookmark the permalink. This is the Shabad I listen to most when in a classical mood. 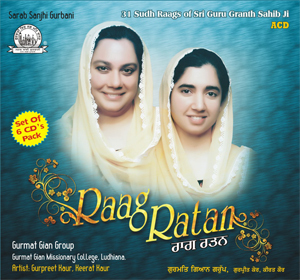 The Shabad in Guru Granth Sahib ji is in Raag Sarung. In this case probably it is sung in Bindranbani Sarung. It starts with traditional introductory “alaap” in Ek-taal (12 beats) and the bandash picks up in fast ektaal or “yakka” but changes to slower, almost “dhur-pat” style (question in 9 beats & which taal?) in “antra”. Most attrative are taal “deep chandi” (14 beats) and teentaal (16 beats), when the tempo picks up later on. Perhaps Bibi Gurpreet kaur ji can comment on my understanding and appreciation above. 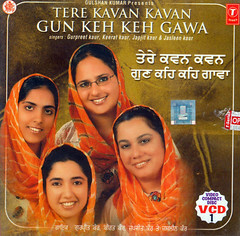 My generation would like more of these types of classical Shabads and puratan reets (ancient classical Kirtan tunes) revived, albeit, sung in Bibian style, in future. 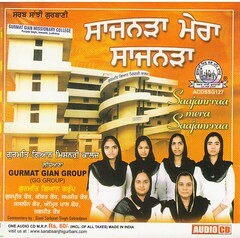 This is the first Shabad “Jap Man Jagannath Jagdishro” that was recorded by Gurmat Gian Group. Yes, its sung in Sarang. Bhai Sahib, according to me you seem to be having lot of knowledge of Sangeeet. 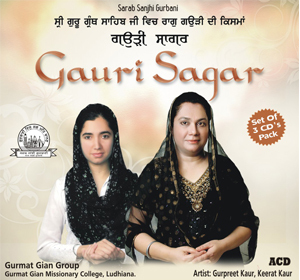 Gurmat Sangeet Sarang (according to my limited knowledge) is similar to Brindavani Sarang of Bharatiya Sangeet. Shudh Sarang of Bharatiya Sangeet is different having Tebra Madhayam in aroh avroh and Dhavat in avroh. I would like to know the difference between the Gurmat Sangeet Sarang and the Brindavani Sarang which I thought to be the same. The 9 beats taal which you asked is Math taal. This changes form with the type of bandish still remainng in its 9 beats. The original Math Taal has 18 beats (Shangeet Vishard) which is divided in 9 Bhags. We too are very much keen to sing some puritan bandishes by learned ragis. It would be nice if you could bring to our notice such puritan bandishes. My father Brigadier Harminder Singh who was a dental surgeon in Indian Army was a very good Kirtankar. Some of his old bandishes are yet to be recorded by us. He had been singing from All India Radio from Bombay, Calcutta, Lucknow etc. He was always a driving force for us to do good Kirtan. We miss him a lot. As you noted, Shudh Sarang of Bharatiya Sangeet uses Tebra Ma in aroh and avroh and Dha in avroh. According to Sant Sarvan Singh Gandharv komal Ni is used in Avroh also – not sure which school he is following. Avroh: Sa(taar), Ni (komal), Pa, Ma Re Sa. 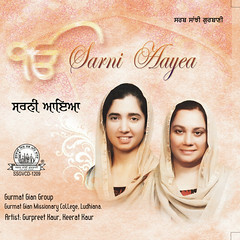 Bhai Avtar Singh (deceased) sang Gurbani reets only and gives the above notes as “Rag Sarung”. Principal Dayal Singh of Gurmat Vidialla, Gurduara Rakab Ganj, who gives the same notes, writes,”Say “sarung” or “Bindrabani Sarung” they are the same.” So you are right, the Sarung raag in Gurmat Sangeet is in fact Bindrabani Sarung. About puratan reets, I have in mind reets sung by Bhai Autar Singh – maybe too slow for your Kirtan style, and Bhai Santa singh. Bhai Bakhshish Singh sang the traditional reets but not quite in the same meditative slow (8 maatar) beat of the old spiritual Kirtanias. Ragi Surjan Singh was not in the same category but was close when he sang Shabads like “Mil Meray Pritma jio…..”. The same goes for other great Kirtanias like Bhai Samuind Singh ji and Bhai Dharam Singh Jakhmi. Our father Giani Harchand Singh Bassian (Malaysia) was not a ragi, but did sing many old traditional reets in slow, highly spiritual and meditative mood. Some of these have been re-recorded by youngest brother Dya Singh of Australia but not quite. Hardly any Darbar sahib raagi today can sing those puratan reets in the same style. Let us compare notes at some future date. I am only a humble student of Gurbani sangeet and have now forgotten most of what I learnt in younger days. I can no longer recognise most raags by just listening now. Have to get hold of a harmonium to wortk out ! Best wishes & may Waheguru bless the Group. Sat Sri Akal Harjinder. Give me few days and I would send you the notation for this shabad. Keep listening to the Shabad repeatedly and get the feel of the composition. that would help you to learn it. Good Luck. Keep visiting the site and enjoy the Bliss of Gurbani.